There’s a lot of dirt and noise going on around the library and you might be wondering what it’ll look like when it’s done. Well, wonder no more! Here are some sneak peeks of what your new library will look like when we’re finished. First, let’s take a look at the outside from this 3D rendering of the library viewed from the front northeast side. You can easily see the large multipurpose room connected to the left of the existing library. The multipurpose room is where the majority of our large events will be held and it’s really cool. As you can see in the floor plan below, it has a stage that will raise our performers up so everyone will have a better view. However, this room isn’t all about the stage. Its flat floor plan and removable seating will allow us to use the space for library art shows, photography shows, summer reading events, book sales, and other library events needing a larger space. Our expansion doesn’t stop with one awesome room. If you take a look a closer look at the floor plan below, you’ll notice a ton of other changes. 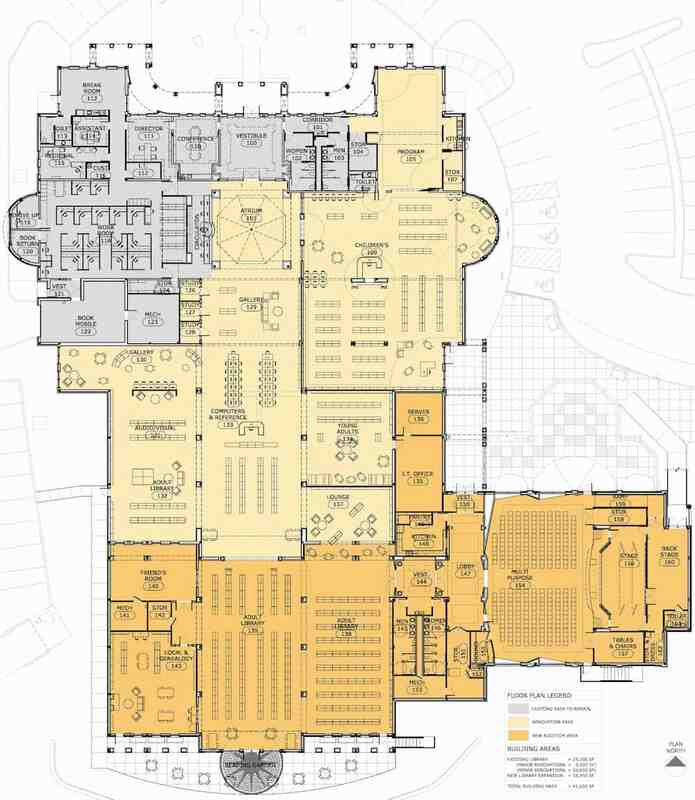 Most notably, our children’s area nearly doubles in size, encompassing the existing Kentucky Room which will move to the new southeast corner of the library . Also, our general public area will increase considerably, allowing room for more shelves, books, and places to enjoy them, like in our new young adult area. With all the great new additions to the interior, we didn’t forget about the outside. One such addition will be a partially covered patio area that’ll be a great place for patrons to enjoy a snack with their favorite book and may also be the location of a few unique events in the summer. Last but not least, there’ll be lots of PARKING. You can’t really see it from the pictures on this page, but there’ll be a substantial increase in parking. Anyone who has been here for a popular event and struggled to find a place to park will really appreciate this part of our remodel. So there you have it–a quick sneak peek of what’s coming to your library. We know you’re going to love it!